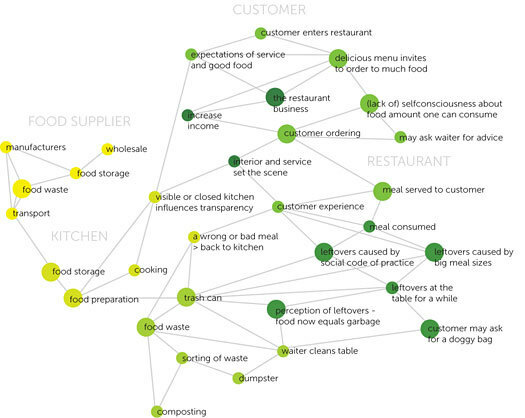 Designer Christina Amelie Jensen created this web to show the ‘issue space’ of food waste in the restaurant context. One can imagine how much more complex the web would become if it were to include other sectors. For instance, how would it change if it were looking at the household level? This web is useful for beginning to think about the many connected actors and processes that contribute to the creation and disposal of food waste. This entry was posted in food waste and tagged food waste, restaurants by laurapenney. Bookmark the permalink.